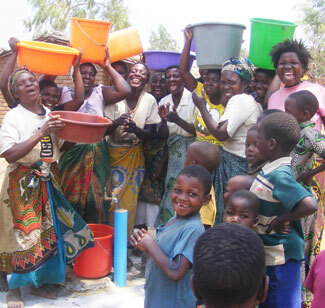 “Water is life!” A frequently heard term in Malawi - but so true. 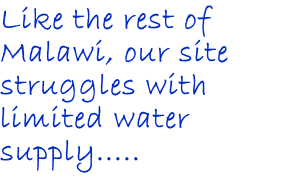 With only one rainy season a year and no storage infrastructure, water shortage is a common problem in this part of the world. 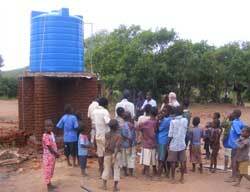 In the rural areas, boreholes are the primary source of safe water. There are more community pipelines being run from nearby mountains, but many still see their main water source as a local river - potentially polluted, and likely to diminish in the dry season. The local communities rarely have the resources to replace broken and worn parts, so our work restores clean, safe, local water to many thousands each year. 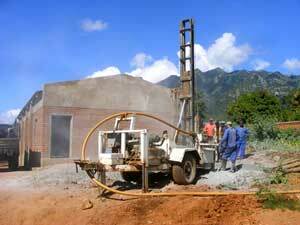 In 2010, as our Centre in Chiringa developed, we tried to drill a borehole on our site. We needed an independent, reliable water supply, not only for domestic needs, but irrigation of crops and hygienic disinfection of goat kholas and equipment for a high milk yield. Initial survey results were inconclusive, but armed with a lot of positive anecdotal evidence we watched them drill through 46mtrs of solid granite and come up dry! To maintain our projects, over the years we’ve constructed, then extended, pipelines from several sources to bring water to site. 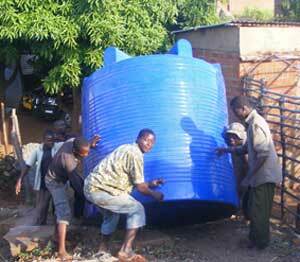 In 2011 we installed 2 x 5000 ltr tanks, collecting and storing water overnight for use the next day, thus limiting competition with local villages in the daytime hours. Especially important during the dry season. 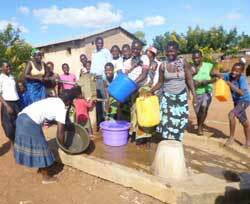 In 2014, in partnership with Wilmslow Wells and local villagers, we put in a major pipeline to provide tapped water to Bilisoni Village. Villagers dug trenches to carry the pipes, builders constructed the cement aprons around the taps and about 500 people benefited with flowing water on the turn of a tap for the first time ever. 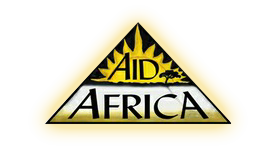 Other water-related help we’ve been able to give is digging wells, building bridges, and installing a water storage tank in Monjo Lea School, a huge primary school without water supply control, trying to feed over a thousand children each day! 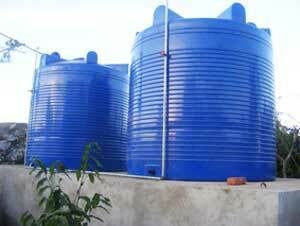 Wells, water tank & bridges ….